White(board) Magic! – Webinar | E-verything! This week’s Edublogs Webinar (recording here ) was one of our occasional sessions focussing on a tool, or feature of using Elluminate. I tend to feel that I’m a bit too “close” to these particular sessions to give a very objective overview, however I will do my best! I am always very conscious with Elluminate that many people use it just as a “lecture” platform. There is a tendency to just put a Powerpoint on the whiteboard and “talk to it” (sometimes literally it seems to me!). I am also very aware of my own tendency to “glaze over” or switch my attention to something else in a face-to-face context if it is just reading from slides or even using them properly as “hooks” for talking about. How much harder is it to continue paying attention in a virtual context where there is no body langage or visual stimulus from the presenter or other participants. So, now and again I get on my own particular hobby horse about some of the many ways you can use Elluminate in an interactive way with participants. This session highlighted some of the ways the variety of whiteboard options can be used to keep participant interest and also be aware of who is participating and who is (possibly) not paying much attention! We had participants with varying levels of both Elluminate generally and whiteboard experience. Trying not to overface those new to Elluminate while providing a challenge to the more experienced is always a bit of a balancing act. Where were we coming from? I used some polling to ask about the experience of the group in relation to maintaining their own attention during both face-to-face and virtual sessions, most people had experienced the “switching off” tendency in both situations. Almost all admitted to having been in a virtual session where only the “off topic” content of the backchannel kept them awake. 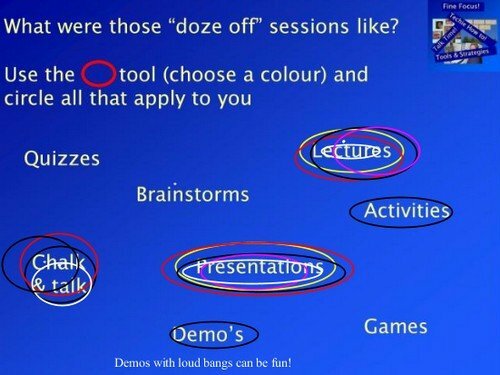 As we would probably all expect the way the sessions were managed had a distinct impact on the tendency to doze off! The main part of the session gave everyone the opportunity to be moderators. This is fun but always chaotic! Before giving moderator status to everyone I gave an overview of some of the whiteboard tools available to moderators. Moderators have access to tools that participants can not normally use. These can be found on the Whiteboard tool set next to the whiteboard with others available through the “Tools, Whiteboard” menu. Some of are very useful when working with whiteboard interactives. For example the ability to move objects in and out of the background – an object moved into the background cannot be moved or edited. This is great if you need to create an instant drag and drop to illustrate/extend a point, or assess understanding in a session. Other whiteboard tools available to moderators are great for organising whiteboard contributions. For instance you can group, align or distribute objects in a similar way to in Powerpoint and also copy and paste objects between screens. Yet other tools enable you to see who is contributing (Explore Objects) and to monitor activity on breakout room whiteboards -Explore Screens and then select the screen. Once everyone had moderator status we quickly reached the anarchy stage. I love this because I find that everyone starts playing with new tools they have available so we jump around the whiteboards and all sorts of things happen. However we re-established some sort of tenuous order and moved on. I had previously created several breakout rooms each with a preloaded activity on the whiteboard. The next step was for the group to distribute themselves to breakout rooms in pairs/small groups and try out the activities. We had a few problems at this stage – the combination of breakout rooms and everyone being moderators put quite a heavy load on Elluminate and also on my own computer. So from my perspective there were some frustrating moments when I was struggling to move between breakout rooms to check out progress. This also led to some problems for participants because the slow response meant that I inadvertently moved people between rooms a couple of times. Being teleported like that can be very disconcerting! However all was sorted at the end and everyone brought their activities back to the main room. Despite the somewhat flakey nature of the activities everyone seemed to enjoy the session and the opportunity to play with the whiteboard in ways other than just brainstorming. There were several requests in feedback for more opportunities to play with Elluminate tools/features. As always after these sessions I have mixed feelings – I love doing this sort of thing and people always seem to get something out of them. However I just don’t feel that I do them well enough and I do sometimes push the technology too far! Then again we all learn from what goes wrong when I am too ambitious :). Our next Webinar is an Edublogs Serendipity – unconference session so bring along your hot topics and burning issues and throw them into the melting pot for the poll to choose our topic in the first ten minutes. This entry was posted in Uncategorized and tagged Elluminate, interactive, recording, student engagement, virtual classroom, virtual classtoom, webinar, whiteboard by johart1. Bookmark the permalink.